They say that geniuses often choose the color green. Choosing these return address labels is a good idea no matter what shade they're in. The sleek and sophisticated design makes for a professionally attractive finishing touch on letters and packages. But what's really brilliant about this product isn't the color or the eye-catching pattern. When you use your new labels, you'll be saving a considerable amount of time. That's because they are printed on a self-adhesive stock. Just peel and place them on every envelope to make the task of preparing outgoing mail super simple. 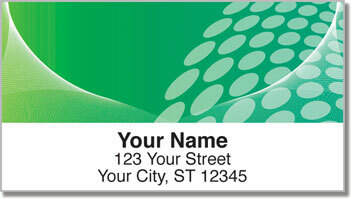 Get your own Green Contempo Address Labels right now! We also offer colors for folks with normal IQs. And don't forget to take a look at the matching personal checks.